THE King and Queen are set to pay a visit to Malaga’s Picasso museum on Friday. This is the first official visit that King Felipe and Queen Letizia will make to Andalucia since the coronation in June. After taking in a spot of culture, the royal couple will attend an official dinner at the Automobile Museum, where King Felipe will deliver a speech. 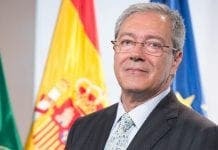 But it has been a busy week for Felipe, who welcomed the president of the State Council Jose Manuel Romay and the president of the Audit Court Ramon Alvarez de Miranda to La Zarzuela, the royal residence in Madrid, on Tuesday. And on Wednesday, he also received Spain’s public prosecutor Eduardo Torres Dulce and Ombudswoman Soledad Becerril to the palace. Next articleCooler than the mint with the hole!